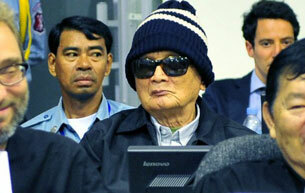 ECCC Reparations: An Old Man's Desire for Comfort or A Snub at the Court? An Old Man's Desire for Comfort or A Snub at the Court? At the outset of his trial Noun Chea requested that he be allowed to wear what looks like skiing attire (see picture; AFP PHOTO/HO/MARK PETERS/ ECCC). He noted his health concerns and the overall climate of the courtroom. The Trial Chamber permitted. While highly unusual, there would be nothing wrong with letting the old man be comfortable particularly as he is about to stand the trial of his life but for the remark Noun made shortly after his wardrobe request was approved. It turns out he is not happy with the court. Could it be that the attire of choice is part of his way of showing the court exactly how unhappy he is (his attire does stick out like a sore thumb and it is impossible not to look at when looking at the courtroom as a whole)?